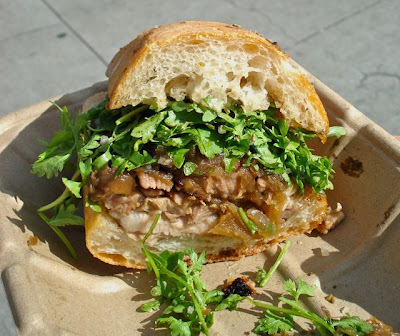 Roli Roti, short for Rolling Rotisserie serves up one yummy roast pork sandwich - the porchetta, a traditional Italian street food. Pork loin rolled into the belly with the skin on and roasted for 3 1/2 - 4 hours. The low temperatures and long cooking times ensure that the roast is super juicy and the pork skin has crisped up. 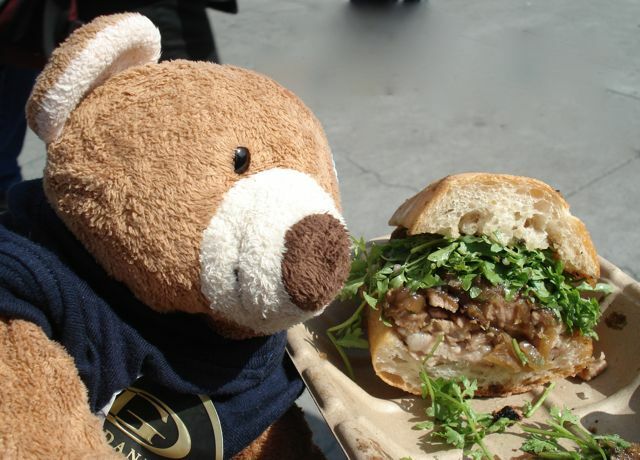 We already had coffee, some mexican food and various snacks when we stumbled upon Roli Roti - ooh roast pork sandwich - we couldn't pass on that. When I was in line, even though I was relatively full, the heavenly smell of the roasting pork and chicken made my mouth water. As they cut into the pork, the juice runs and they quickly mop it up with the bread. A bit of pork loin, a bit of pork belly and of course a bit of the crispy pork skin topped with caramelized onions and a pinch of rosemary salt. Bite into the sandwich and it is crunchy, juicy and tender all rolled into one. Delicious and well worth the wait. They also serve roast chicken and potatoes - next time if I have more space in my tummy, I will try the potatoes which is cooked in pork and chicken fat dripping off. Check their schedule for where the truck will be, we were at the Ferry Terminal Farmer's Market on a Saturday morning.